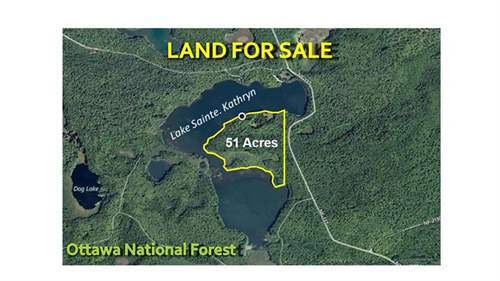 Located within the U.S. Ottawa National Forest, 51+ Acres and 4,500 Ft. of lakefront on Lake Sainte Kathryn, in the Upper Peninsula of Michigan. Own an untouched pece of America, a pristine peninsula jutting into one of the larger lakes (151 acres, 25 ft deep), with 4500+ feet of shoreline as well as a small meadow, forests of both hardwoods and pine, and a vintage three room cabin with both a woodstove and fieldstone fireplace. Set entirely within the Ottawa National Forest (with right of way) this is the perfect place to enjoy the magnificent solitude of the north woods. The lake is stocked for fishing and canoeing is excellent in the nearby Paint and Brule rivers. The many surrounding forest roads offer wonderful trails for cycling and snowmobiling in the winter. Weather.com selected the Upper Peninsula as one of the Top Ten Winter Family Getaways in America. Sherman's Travel selected the Upper Peninsula as one of the Top Ten Summer Destinations in the World. The lake is only 8 miles from Prickett-Grooms Airfield in Sidnaw, MI (6y9) and 80 miles from Sawyer International Airport in Marquette, MI (MQT). The Houghton County Airport (CMX) is 66 miles away and the Duluth, MN, International Airport (DLH) is a 3 1/2 hour drive. Supplies and access to Lake Superior at L'Anse are only 45 minutes away.